So well received was Ultraframe’s attendance at Glassex this year, that the company has already booked for next year! Mark Hanson, Marketing Manager at Ultraframe talks about the new products that retailers will have seen at the show. Having risen to the challenge this year, how can Ultraframe have as many interesting and varied products on the stand next year? The principal objective of Ultraframe’s attendance at this year’s show was to inspire retailers with a vision of what can be achieved with both existing and new products/ concepts. The 15 staff that manned the stand – representing sales, marketing, technical support and training – were busy for the whole four day show. Those visiting the stand – and over 300 action requests for follow up were made – voted the Veranda conservatory to be a big hit....as did the show organisers who made it ‘best in show’ product. 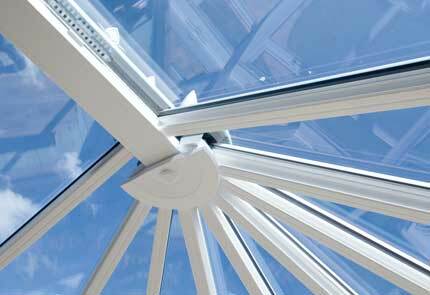 Other products appearing for the first time – Classic Plus, Shades, aluminium roof and cornice/decorative pillar were also highly rated by retailers. Lets now look in detail at the features and benefits of the Classic Plus roof and Shades, the first of this array of new products to come to market and on general sale in January. Shades are a cost effective shading product that offers significant additional features when compared to traditional pleated blinds. Shades can be designed as one piece panels or as ‘split sliders’, like sliding sashes. Mimicking timber conservatories, the T shaped under claddings on the glazing bars look elegant yet strong. To accommodate these T shaped claddings, the ridge and valley under claddings have been made deeper too, and all three products use Ultraframe’s well established chambered twin wall technology to improve thermal performance. Fitting the roof couldn’t be easier either. As you would expect, everything is exquisitely cut and prepped to aid ‘right first time’ installation. Jack rafter undercladding joints and intersections are neat and close fitting. New tie bar brackets have been introduced to work with the T shaped under claddings. Should spotlights be specified in the ridge or wiring needs to be run around the conservatory, then the new deeper ridge cladding lends itself to this task. By careful selection of the fabric and by having an understanding of the orientation of the property and its age, it is possible to have a conservatory design that optimises four season comfort . For example, it is feasible to design say a gable design, one slope of which is south facing and insert one of the high performance fabrics into that slope only, reducing summertime heat build up. The introduction of Classic Plus and Shades further blurs the conservatory/home extension continuum; through the launch of its Orangery products ( the company now offers two types) and the Veranda style show winning concept, the company recognises the trend to ‘cross-over’ conservatories, which give consumers even more benefits. Furthermore, conservatories have always been an excellent way for consumers to merge the home and garden, but Ultraframe is taking the idea to a new level with its Veranda conservatory. The glazing bars in the roof oversail and carry the glass with it, to form a protected pocket where the consumer can sit in the garden but sheltered from the worst of the elements. Moreover, on a warm day - by using large in line sliders or bi-folds and of course Ultraframe’s Super Duty Eaves Beam which allows longer spans without deflection – the retailer’s customer then has a much bigger space to enjoy, perfect for family barbeques! Retailers who visited the show had a feast of new products to tempt them and ensure that they could view the future with more confidence and optimism.